HEIRLOOM. This Burpee-bred bean is entirely stringless, brittle, meaty, juicy and has exceptional flavor. 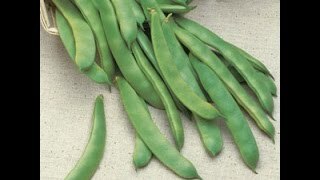 Plant yields are early and extremely high, pods are round, about 6" long and slightly curved. Plants are entirely self supporting. Our seed is not treated. Bean, Burpee's Stringless Green Pod is rated 3.8 out of 5 by 27. Rated 1 out of 5 by katstup from disappointed........ My retailer didn't have the Burpee Blue Lake Beans this year, so I purchased the garden bean; what a disappointment........ I didn't harvest enough beans to use for a meal; they were small, and "C" shaped. I won't purchase this type next year. Rated 1 out of 5 by truckermama from Poor Germination As a child, my mother always swore by Burpee. As a young mother, I swore by Burpee. Now that I'm close to retirement age, I am sadden by the quality of this bean seed. I've gardened all my life, enjoying the labor of my fruits. I've always gotten great results until this year. Out of 3 packets of seed, I have only 2 plants that germinated. I did what I've always done, but to no avail. Now, I have to reseed and I'm concerned about buying this product again. Was this just a "bad batch"? If necessary, I guess I'll have to find other seeds if this is not available and break a family tradition. Rated 5 out of 5 by Cheri in AnnArbor from Fantastic Healthy & Tasty!! Grew theses last year along with Gold Mine. THey produced an ABUNDANCE of long, straight, full, juicy beans! No brown marks, little to no curve. Not tough, excellent tasting and healthiest plants I ever had! I did use Burpee's Bean Innoculant when starting. 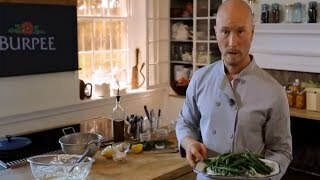 Here's a pic of a bean salad I made with them last year. YUMMY! Rated 5 out of 5 by Nandogreeenthumb from Grew from a plant last year this starting my own I bought plants last year for this variety. I use 10-22 inch pots for everything. they grew fine for me in a 21.5 inch pot. This year I am starting them myself. I'll report back on how well they grow this year. Rated 1 out of 5 by Jo61 from Curved beans From the time the beans first appeared in the plant they were curved like the letter C. Plants produced very few straight beans. I will not buy these again. Rated 1 out of 5 by Mimi10 from Poor Fruit I had nearly 100% germination, and plenty of flowers. The beans were small and "pregnant" in the middle. Many were hollow and turned little. We have picked constantly what little we had. We grow all organic and I have never had a problem with beans. However, I never used this variety either. We always grow bush, since we can experience high winds. Bummed. I even used the inoculant you sell.